The frightening Department of Military Intelligence (DRS,) which has genuine control over power in Algiers, has already made its choice as to the future leader of the Polisario and President of the so-called Sahrawi Republic (SADR.) It picked Brahim Ghali, a false Sahraoui of Algerian descent. The reason behind this choice is quite the same as that which was behind the assassination by the DRS on June 29, 1992 in Annaba, of the former Algerian President Mohamed Boudiaf. To make the territorial conflict that was created by the Algerian regime over the Moroccan Sahara last, Algerian rulers deemed it necessary to physically liquidate Boudiaf. Actually, the late President was viewed by the Generals as pro-Moroccan and as preparing a settlement in favor of Morocco. Unlike Boudiaf, Brahim Ghali is for the DRS Generals the best profile that can stand up to Morocco and undermine any settlement of the Sahara dispute. In unprecedented remarks, Algerian retired General Khaled Nezzar has recently confessed that Mohamed Boudiaf was indeed assassinated by an officer of the DRS because of his support to the Moroccan identity of Western Sahara and his refusal to support the Polisario mercenaries. Nizzar’s confession, as reported by an Algerian Arabic language newspaper, leaves no doubt about the motives and perpetrators of this heinous crime, knowing that this is the very Khaled Nizzar who was at the time head of the Algerian army and the Algerian defense department. The Polisario Front was created out of nothing by the late President Houari Boumediene who bequeathed his people a never ending territorial dispute with neighboring Morocco. Actually, no one ever heard of the Sahrawi separatist movement, the Polisario, until 1973, two years before the historic Green March which marked the end of Spanish rule. With the support and blessing of the DRS, Brahim Ghali, the former “Defense Minister” and former ambassador of “SADR” in Algiers, will certainly have no difficulty in taking over from Mohamed Abdelaziz, during the 15th Polisario Congress, scheduled for July 8 and 9. 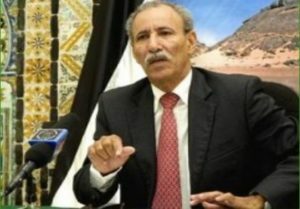 Shortly after the death on May 31 of Mohamed Abdelaziz, Ghali’s supporters from the great Rguibate tribe circulated in the Tindouf camps a recorded testament, allegedly made by Abdelaziz. In the recording, Abdealziz designated Ghali as his successor. Nothing could perpetuate better the singly candidate pseudo-democracy.